Bright lights, screeching tires and the smell of burning fuel - that's what characterizes the new chronograph Silverstone Stowe GMT Blue & Yellow, which at full speed drives on the race track. Silverstone Stowe GMT Blue & Yellow with distinct blue and yellow colors - the king on the highway. He is unbeatable with its advanced mechanism and a flawless performance for racing. The new chronograph Silverstone Stowe GMT Blue & Yellow Ref. 2BLCH.B06A has released in limited quantities in 250 copies and is dedicated to Formula 1 racing. Silverstone - a Grand Prix track in the UK, and Stowe - turn on this track. The model is based on the manufacturing automatic caliber G1721 with bi-compax and Incabloc shock absorber. The carrying frequency of the mechanism is 28 800 vph. The caliber is paved with 28 stones and has a 48-hour power reserve. The case of the model 48 mm in diameter is made of stainless steel. The crown and chronograph buttons are located on the right side, decorated with a pattern Clous de Paris pattern. Black carbon fiber bezel with blue markers is graded by the second time zone. The caseback and dial is equipped with a sapphire crystal with anti-reflective coating. On the caseback there is the serial number of each model. Chronograph function is displayed on a 30-minute display at 3:00 position and a central second hand. Chronograph function is improved by function Flyback. A large date aperture with double-disc, peculiar to sport watches, is located on the dial at 6 o'clock position. For easy reading of black carbon dial, the central hour and minute hands and lacquered arabic numerals are coated by the yellow fluorescent substance Super-LumiNova. Black hand of the second time zone is selected with white Super-LumiNova peak and red outline. 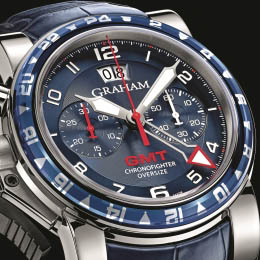 The water-resistant of the chronograph is up to 100 meters. The strap is made of black rubber, which is designed as a tyre tread with yellow linear interpolation. MSRP Chronograph is 9900 Swiss francs.